The RV garage portion of this combination garage has a sixteen foot high ceiling accessed though a fourteen foot high by twelve foot wide overhead door. The double car garage has an eight foot high ceiling with two seven foot high by nine foot wide overhead doors. The covered porch opens into the vaulted entry with direct access to the workshop which contains a conveniently located half bathroom. The workshop provides easy access to both the RV and double car garage areas. Add a wall between the workshop and double garage to heat this space if required. The second level is a blank canvas ready to be transformed into a future apartment, exercise room or private home office. Question: I would like the garage to be just as deep as RV garage. And would like RV garage to be a little longer, say 45ft. Need more living space, say about 2000 sq ft above garage, got any plans like that? Answer: Have a look at pre-drawn plan number 76034. It has a RV garage 55’ long with a 18’ plate height. The double car garage is 49’ long with a 9’ plate height. The area above the garage is 1280 sq. ft. and has a vaulted ceiling. 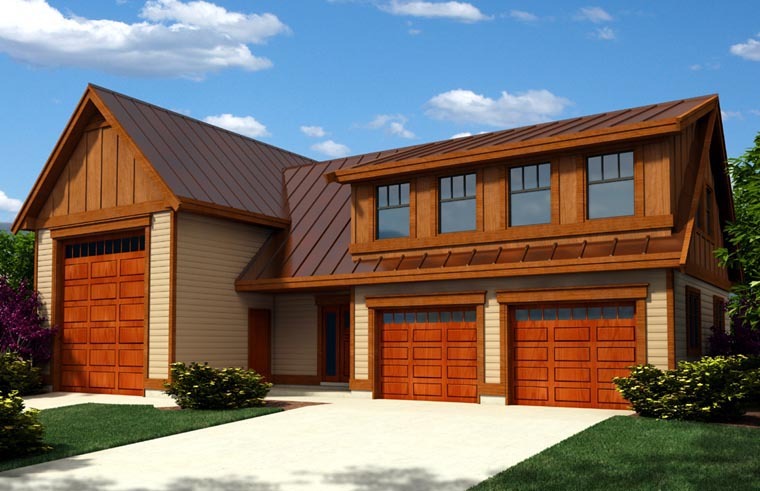 As an alternate I would be happy to modify any of my drawings or design you a custom garage to meet your specific requirements. Answer: Please have a look at garage design 76024, which is 24’ x 36’ and similar to 76023 but without the RV garage portion. Otherwise I would be happy to modify any of my plans or design you a garage to meet your specific requirements. Thanks for your interest in one of my designs, Regan.